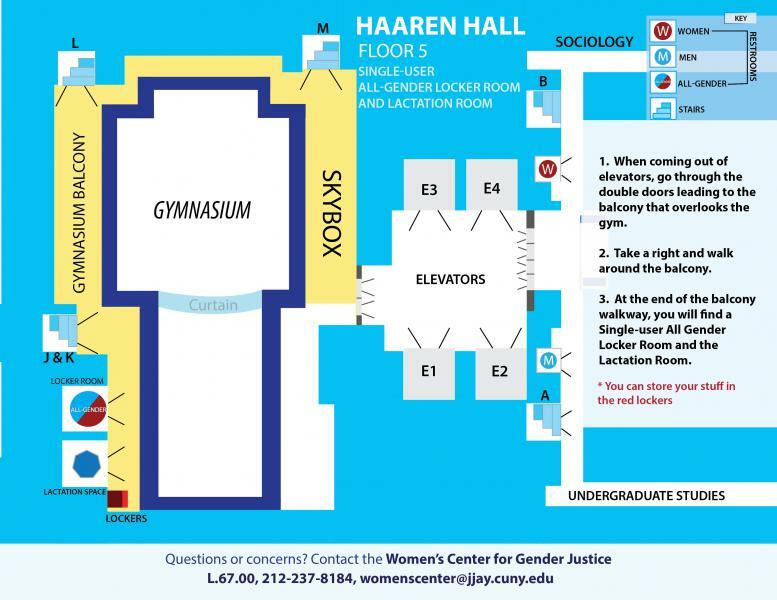 Haaren Hall, 2nd floor: This bathroom is on a hallway that runs south between the Haaren Hall elevators and the small JJay Cafe (the hotdog stand). 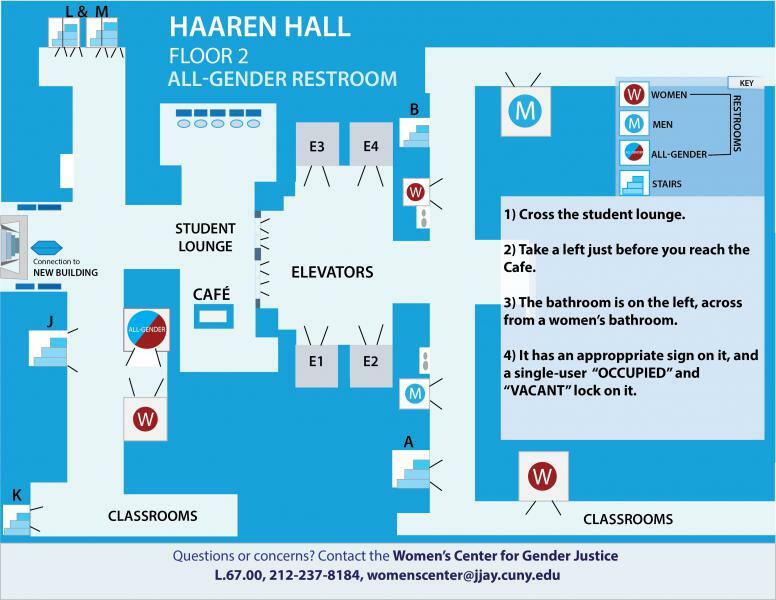 If you're on the second floor walking from Haaren Hall to the New Building, take a left just before you reach the Cafe. The bathroom is on the left, across from a women's bathroom. (It was previously a men's room.) The bathroom has the appropriate sign on it, and a single-user "occupied" and "vacant" lock on it. Westport, 1st floor: This bathroom is located just beyond the Public Safety turnstiles. Go through the turnstiles and then head to the right (instead of heading towards the stairs). Go through the set of double doors and on the left is a single-user bathroom. Option #1: 2nd floor, inside the faculty/staff dining room 2.61. The fac/staff dining room is on the south side of the building. If you're walking from the cafeteria, the entrance is on the right just before you would walk out onto the J Walk. After you walk into the dining room, just cross the room diagonally and there are two single-user bathrooms in the far corner. Option #2: 1st floor, inside the Wellness Center, L.68: The first time you access this bathroom, you should go to the Wellness Center reception desk in L.68, say that you'd like to use the bathroom, and one of the staff members will show you where it is. Once the staff become familiar with you, you'll likely be able to use the restroom without checking in at the reception desk. When you come out of the Haaren Hall elevators on the 5th floor, go through the double doors that lead to the balcony that overlooks the gym--NOT the double doors that lead to classrooms and academic departments. After you go through the double doors, take a right, and walk ALL THE WAY AROUND the balcony. At the end of the balcony walkway (it does not circle all the way around) you will discover red lockers you can store your stuff in while you work out (bring a lock!) and a single-user room with a change space, toilet, and shower. This is not an ideal location, but such a room **exists** now, which is good. A better location is in the plans when the 3rd-floor main locker rooms get renovated. The Lactation Room is the last door on your right, adjacent to the All Gender Locker Room. The lactation space locks from the inside, there is a table, chair, access to an electrical outlet and sink. Unfortunately, it does not have a refrigerator, as this is our temporary space.